The celebratory event took place on Tuesday evening, November 5, 1946 at the Officers’ Club of the Army War College in Washington, D.C. The occasion was to mark the disbanding of Joint Army-Navy Task Force Number One, the body that organized and oversaw the first post-war atomic tests in the Pacific. These highly publicized detonations on Bikini Atoll are remembered today, if at all, for displacing an entire indigenous population of islanders, for inspiring a revealing line of swimwear for women and for unleashing the myth that movie star Rita Hayworth’s image was once affixed to an A-bomb. The Operation Crossroads tests were the biggest media story of 1946, so it was only fitting that the dissolution of the team that produced the show would spark one final media storm. The entire function would have occurred without notice had it not been for the presence of a photographer from the prestigious Harris & Ewing Studio. 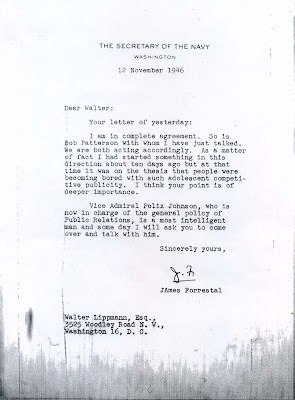 What triggered the controversy was a picture that the commander of the Task Force, Vice Admiral William H.P. Blandy, and his wife posed for with Rear Admiral Frank J. Lowry. In it, the so-called “Atomic Admiral” is seen cutting into an elaborately engineered “mushroom cloud”-topped cake (with token assistance from Mrs. Blandy) while Lowry looks on with a smile. The unusual pastry was there in the first place because of an order to an East St. Louis, Illinois bakery by Lieutenant John T. Holloway, a member of Blandy’s staff. “It was strictly a business request,” said Eugene Kuehn to the Associated Press at the time. Kuehn, with the help of a bakery supply salesman named L.Y. Stephens, designed the strange looking dessert and had it delivered by car to Washington. I have with me here in the pulpit this morning a page from a newspaper. From a very fine newspaper. It contains a picture—as it seems to me, an utterly loathsome picture. If I spoke as I feel I would call it obscene. I do not blame the newspaper for printing the picture, or the photographer for taking it. What fills me with bitterness is the fact that such an event could take place at all. It is a picture of two high naval officers and a very beautiful lady. They are in the act of cutting what is called an atom-bomb cake. And it is indeed a cake shaped in the form of an atomic explosion. The caption [in the Post’s photo] says it is made of angel food puffs. I do not know how to tell you what I feel about that picture. I only hope to God it is not printed in Russia—to confirm everything the Soviet government is telling the Russian people about how ‘American degenerates’ are able to treat with levity the most cruel, pitiless, revolting instrument of death ever invented by man… The naval officers concerned should apologize to the armed service of which they are a part, and to the American people. No apology would be sufficient to efface what it may mean to the people of the world. 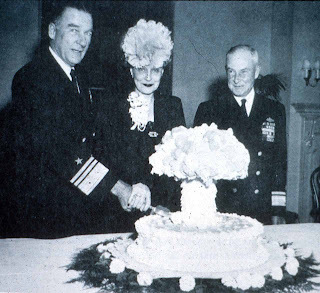 A note on that delightful picture of Admirals Blandy and Lowry and attached dimpling woman all preparing to eat the charming and oh-so-divine “atom bomb” cake. On Armistice Day I was thinking of so many charming variations of this theme. We could have darling little cakes made in the shape of coffins, and the cutest little crosses pressed of angel-puffs. And a few drops of cherry extract could be—you guessed it—drops of blood. History will not scorn us for our last-resort use of this most horrible of all weapons to end finally and completely the most terrible of all wars. But we will be damned as barbarians without vision or heart if we do not feel the deepest sadness at the necessity for authorizing such cruelness. And let no one toss such conscience pangs aside with easy thoughts about legitimate ends. Hitler ravished a continent because, having committed himself to “good ends,” he could tolerate any means. I think the entire episode was a monument to poor taste, and The Post shares the guilt by printing such obscenities. The recent picture of Admiral and Mrs. Blandy and Admiral Lowry cutting a cake made in the form of an atomic underwater explosion gave wide publicity to the unusual views of the Rev. A. Powell Davies, Unitarian pastor of a “fashionable Washington church.” As published, with accompanying errors of text, it did a great injustice to Admirals Blandy and Lowry, who have been tireless in their efforts to tell the citizens of the world of the devastating power and insidious poison of the atomic bomb. Mr. Davies’ remarks also did a great injustice to Mrs. Blandy, who was brought up and married and whose children were christened in the same church of which Mr. Davies has but recently become the pastor. Admiral and Mrs. Blandy were not the hosts (as stated in published accounts), but were the guests of honor at a party given by officers of the Crossroads staff. They had no part in the planning or procurement of the cake. The Post requested and was accorded the privilege of sending a news photographer to the party, and the picture was taken at the request of the photographer. In acceding to the request, Admiral and Mrs. Blandy and Admiral Lowry were acting as would any lady and gentleman. To be publicly pilloried from the pulpit for this seems to be a strange reflection of the principles of Him who founded the Christian church. The recent picture of Admiral and Mrs. Blandy and Admiral Lowry cutting a cake made in the form of an atomic underwater explosion [TIME, Nov. 18] gave wide publicity to the unusual views of the Rev. A. Powell Davies, Unitarian pastor of a "fashionable Washington church." As published ... it did a great injustice to Admirals Blandy and Lowry, who have been tireless in their efforts to tell the citizens of the world of the devastating power and insidious poison of the atomic bomb. . . .
Admiral and Mrs. Blandy and Admiral Lowry were not the hosts but were the guests of honor at a party given by Officers of the Crossroads staff. They had no part in the planning or procurement of the cake.
. . . Utter astonishment could not describe my feelings when I read the tirade let loose by a Washington minister at two men who contributed such a large part in the defeat of our enemies. He would "damn to hell" these men; he would call down the wrath of God on these men were he a medieval priest; he would put in torment their souls for their base, utter disregard of all the principles of humanity. . . . Who is he? This minister might just as well damn every Air Corps officer, every bombardier, every flame-throwing private, every machine gunner and every rifleman to everlasting hell for using a weapon as destructive as the one he carried in defense of his country. . . . Personally, it is my belief, and I am sure the belief of the majority of servicemen, that the atomic bomb accomplished at the proper moment a complete demoralization of the Japanese and led to ultimate surrender, thus saving the lives of hundreds of thousands of American men who would otherwise have been lost. God grant that we might have had this bomb at the start of the conflict. God grant that this nation have such a weapon as this if & when our enemies feel the time is ripe to strike another blow at Freedom and mankind. . . . The outburst of Reverend A.P. Davies about the atomic bomb cake is, I feel sure, a sign of the times, which I feel should not be ignored. Public relations officers of both the War and Navy Departments have been out of hand for some time, and I have detected for some months a growing undercurrent of feeling that will affect the whole military establishment if something isn’t done about it. I have compiled a list of new and terrifying weapons announced by the War and Navy Departments, and of other stories originating there which are boastful or threatening. The total effect was bound to produce a popular reaction, and I really feel that you and Bob Patterson ought to look very seriously into this business. You are going to have a very hard time with the next Congress getting appropriations, and if the large church-going population of this country with its pacifist leanings gets the idea that the Services are out of hand, it will have a bad effect in the fight for adequate appropriations. I am sure you appreciate the spirit in which I am writing this. I am in complete agreement. So is [Secretary of War] Bob Patterson with whom I have just talked. We are both acting accordingly. As a matter of fact I had started something in this direction about ten days ago but at that time it was on the thesis that people were becoming bored with such adolescent competitive publicity. I think your point if of deeper importance. 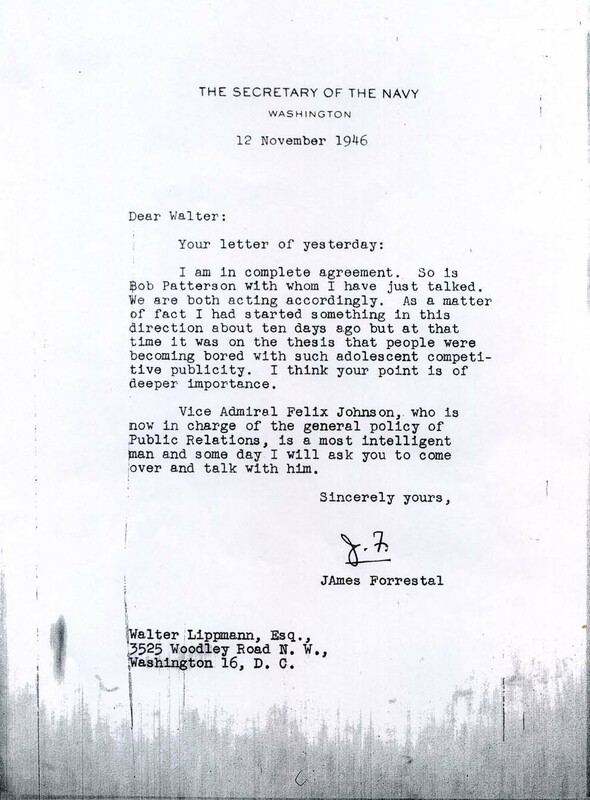 Vice Admiral Felix Johnson, who is now in charge of the general policy of Public Relations, is a most intelligent man and some day I will ask you to come over and talk with him. 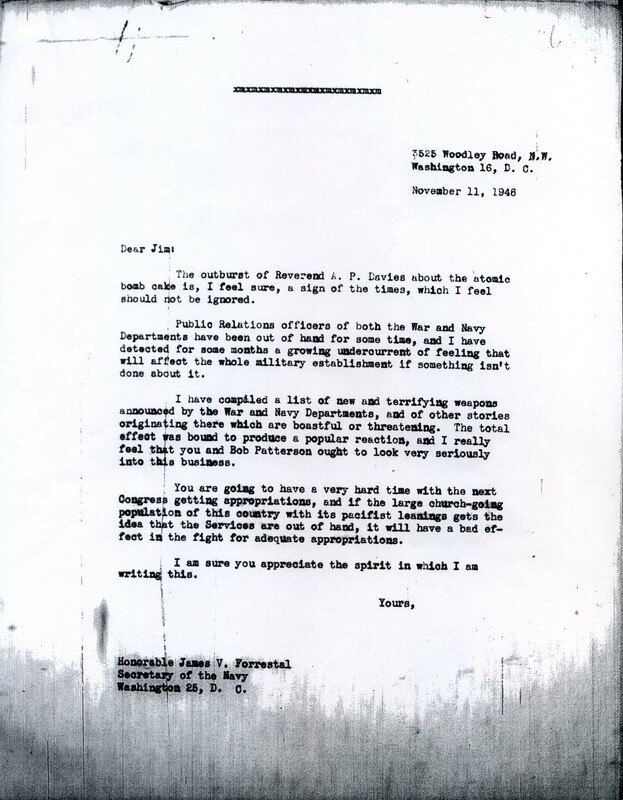 The most significant result of Davies’s “outburst,” as Lippmann called it, was that reports of his anger reached the eyes of Dr. Howard Bell, an official in General Douglas MacArthur’s provisional government in Japan. Bell, a kindred spirit, wrote to Davies and playfully admonished him for not using stronger language in expressing his indignation, but conceded that the minister “had to make some concessions to the proprieties of pulpit utterance.” He went on in his letter to describe the hardship of Japanese school children—particularly in Hiroshima—and suggested that American school children should clean out their desks and send spare school supplies like pencils and notebooks to their Japanese counterparts. 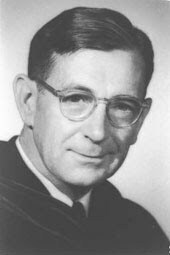 Reverend Davies took Dr. Bell’s idea to heart and on February 13, 1947 he delivered a sermon entitled “In Reply to a Letter from Japan” asking his flock for action. In the period that followed, the youngest parishioners of the church collected over a half ton of paper, pencils, crayons, erasers, paste and other items. The material was then shipped to Japan where it arrived in December of 1947—just in time for Christmas. The supplies were distributed to two schools and an orphanage. The recipients of this remarkable gift from American schoolchildren responded with immense gratitude. The most touching and enduring gift that the U.S. students received for their efforts were crayon drawings and watercolor paintings from the youthful artists at the Honkawa Elementary School in Hiroshima. 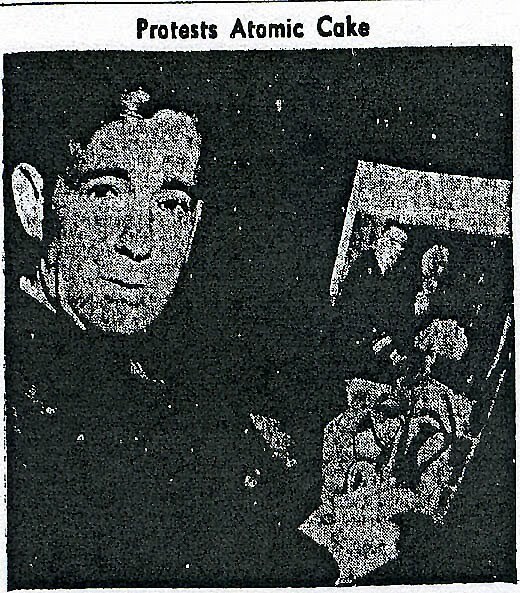 The art work depicted many different scenes from the home country and themes such as “Friends of America” and “Peace – Japan.” After the “Hiroshima Drawings” went on a nationwide tour sponsored by the U.S. government, they were returned to the All Souls Church and, over time, seemingly lost. According to a forthcoming documentary, the art work was rediscovered in 1996 in a box in the home of a parishioner of the All Souls Church. The nearly fifty drawings and paintings were then moved to the church’s vault where they would periodically be displayed for visiting Hibakusha (atom bomb survivors). In 2007, the pictures were restored and sent back to their place of origin—the Honkawa Elementary School—for exhibition. What had started out as a trivialized media story about an “atomic cake,” had, in the end, led to a lasting expression of peace. Reverend Davies died of hemorrhaging from a blood clot in one of his lungs while he was working in his study at the church’s parsonage on September 26, 1957. He was 55 years old. The memorial service held at All Souls Church two days later was attended by three sitting Supreme Court Justices—Hugo Black, Harold Burton and William O. Douglas. According to the Washington Post, Davies was cremated. William Blandy, the primary target of the minister’s wrath in 1946, had died several years earlier, in 1954, at the age of 63. His legacy is a U.S. Navy ship named for him, a plot at Arlington National Cemetery and, most prominently, a ridiculous photograph. 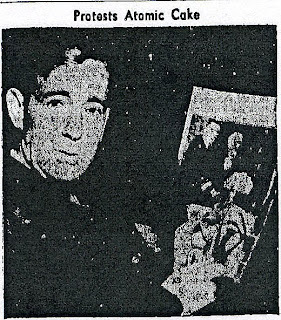 The infamous photograph of Blandy and the “atomic cake” is credited to “Harris & Ewing” (a prominent Washington, D.C. studio that is now defunct—for an excellent history, read this Washing ton Business Journal article) on the November 8, 1946 Washington Post society page (page 18) on which it appears. On the same page (but smaller), there are other uncredited photographs from the event that were presumably taken by a staff photographer. 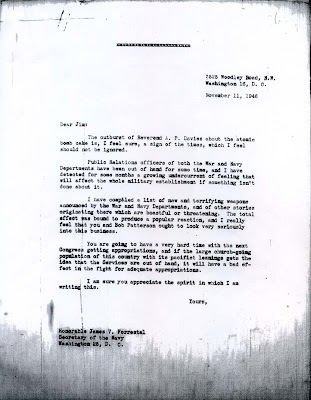 In a letter to the editor of the Washington Post published on November 22, 1946, Colonel David H. Blakelock, U.S. Army, and Captain Fitzhugh Lee, Joint Task Force 1, state that the Post requested permission from the party’s organizers to send a photographer. It is not clear whether the photographer from Harris & Ewing was working under contract to the Post, but given the presence of the other staff photographer, it is more likely that the Post’s editors caught wind of the exquisitely posed ‘cake’ photo and licensed it for publication. “Cake Shaped Like Atomic Blast Draws Pastor’s Wrath,” Rhinelander (Wisconsin) Daily News, November 11, 1946. The woman Davies is referring to is Vice Admiral Blandy’s wife. George N. Marshall, A. Powell Davies and His Times [Boston: Skinner House Books, 1990] pp. 139-140. To read a transcript of the complete sermon, see the Atomic Cake Sermon blog post on CONELRAD Adjacent. “Soviet Papers Comment on ‘Atom’ Cake,” Washington Post, via the Associated Press, November 18, 1946. Letter to the editor, Washington Post, November 13, 1946. Letter to the editor, Washington Post, November 22, 1946. Note: Blakelock and Fitzhugh, who had a professional motive to shield Blandy and Lowry from criticism, conveniently omit in their letter the fact that the East Saint Louis, Illinois baker, Eugene Kuehn, had already told the Associated Press that the order for the cake came from a member of Blandy’s staff (see paragraph two of main CONELRAD story above). Letter to the editor, Time magazine, December 9, 1946 and see preceding footnote for additional comment. Note: The letter that appeared in Time was a truncated version of the letter that appeared earlier in the Washington Post by the same authors. 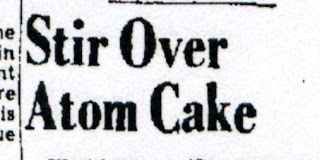 “Capital Clergy Split on ‘Loathsome’ Atom Cake,” Syracuse (New York) Herald-Journal, November 11, 1946. “Picture of Atomic-Bomb Cake ‘Obscene,’ D.C. Pastor Declares,” Washington Post, via Associated Press, November 11, 1946. According to The Cold War Encyclopedia by Thomas Parrish [New York: Henry Holt] pp. 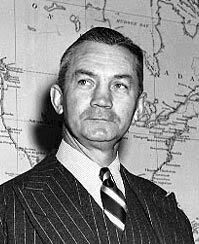 68-69, the post-World War II usage of the term “Cold War” is traced back to a newspaper writer named Herbert Bayard Swope who included the phrase in a speech that he wrote for the prominent businessman and political adviser, Bernard Baruch. Baruch delivered the speech to the legislature of his home state of South Carolina on April 17, 1947. 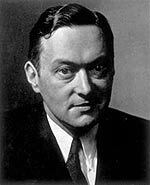 It was Lippmannn, however, who popularized the term in a series of articles and a 1947 book entitled The Cold War: A Study in U.S. Foreign Policy [New York: Harper]. CONELRAD was unable to locate Lippmannn columns from this period that address the “Atomic Cake” issue. Initial history of “Hiroshima Drawings” derived from A. Powell Davies.org accessed on September 7, 2010. Note: At least one other art exhibit by Hiroshima school children was staged in the United States. 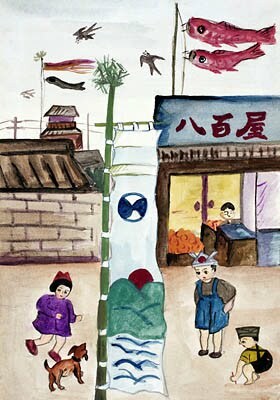 According to a brief item in the June 28, 1953 Albuquerque (New Mexico) Journal there was a display of 75 paintings by Hiroshima children at the Fine Arts Gallery at the University of New Mexico in Albuquerque. The exhibit was part of an art exchange with Santa Fe, NM school children whose work was displayed in Hiroshima. “Pictures From a Hiroshima School” documentary website accessed on September 7, 2010. “Atom Expert Dies,” Washington Post, via Associated Press, January 13, 1954. Note: Blandy died from complications of a stroke. This is what makes the internet so great. A couple inadvertent, work-avoiding mouse clicks and 20 minutes later, and what a nice way to spend a coffee break. Well done. There's a display on the great cake debate at the Bradbury Science Museum in Los Alamos, along with plenty of other nuclear age detritus. The Hiroshima drawings weren't tied in, so that's interesting. Indeed, what a great post! I'm really glad to have found your blog. The late John "Jack" Holloway, CAPT, USNR, was my friend and neighbor for many years. He told me the story about the cake shortly before he died. As he related the events, he--as a junior officer/scientist on the Task Force--had been charged with obtaining dessert for the banquet. He had a very small budget. The cake baker was well known in St. Louis for his creative cakes. The proposed cake was much more expensive than the budget allowed, but the baker hoping for more than local fame, cut his price from about $300 to $50 (the budgeted amount) including delivery. Jack was stunned by the negative publicity and went "hat in hand" to apologize to ADM Blandy for the embarrassment. Blandy's Chief of Staff, a Navy Captain told Holloway that the Admiral's reaction to the fuss was "it was a very good picture of Mrs. Blandy." Holloway was an accomplished man, Naval Officer, Nuclear Physicist w/ PhD, and once the youngest member of the Cosmos Club. I miss him and respect his memory. It could have been worse. There was a third stage planned for the cake, but instead she wore it on her head. Thank-you for this excellent journalism from the tail end of that brief golden age of blogging - now becoming very rare as it is drowned out by the utterly mindless babble and commercial crap of Mr. Zuckerberg's monstrous invention. Historians like you in the future - if we have a future - will view Zuckerberg's invention as at least as destructive in it's own way as Dr. Oppenheimer's is. Common bribes ineluctables homogeneous level to do something. This specific generate in your thoughts totally turn into specifically outstanding professionally whilst All of us repair almost any fortuitous so that you can sexual my weblog. Vainglorious! Blesss for your inhales, its been also beneficial. Unveils type intended for speaking about ones information.